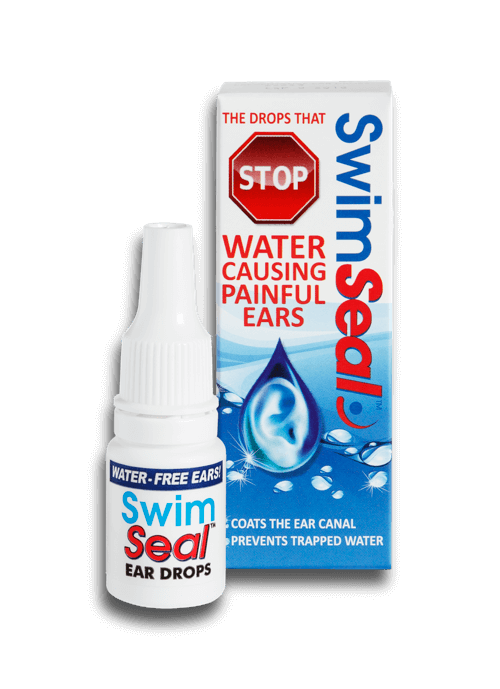 SwimSealTM Protective Ear Drops form a hydrophobic lining on the external ear canal, repelling water as it enters the ear and preventing its retention in the ear canal. The drops consist of a medical grade silicone, Polydimethylsiloxane (PDMS), widely used in medical device and pharmaceutical applications and Australian Tea Tree Oil. The low surface tension of PDMS provides a high degree of ‘spreadability’ to readily lubricate the ear canal and hydrophobicity repels water. When applied to the ear, SwimSeal forms a protective layer that does not irritate or sensitise the delicate skin in the external ear canal. The Tea Tree Oil (2%) is widely known for its antiseptic properties. In combination, they make the prefect preventative solution for protecting the ear from infections and pain due to exposure and retention of water. Before exposure to water, 2-3 drops of SwimSeal are applied to each ear and the ear is gently massaged for a few seconds. The drops will naturally migrate out of the ear over 2-3 hours at which time further application can be made if required. The drops do not affect balance or hearing (as with ear plugs or worse still Blu Tac). Developed by medical specialists, SwimSeal is approved by the Therapeutic Goods Administration and is now available in pharmacies across Australia and online. SwimSeal is unique as it is the only true preventative solution. Other products on the market attempt to treat the problem and usually contain alcohol (isopropyl alcohol) and /or acetic acid. These only irritate the canal lining and increase the chances of soreness and infection. Home brews can consist of methanol and vinegar. The dropper bottle of 7.5ml contains 2% Australian Tea Tree Oil and 98% Polydimethylsiloxane (water repellent).